A short while ago, Microsoft announced 40 Xbox games that will release within the Windows 8 launch window. A few are titles that have never been released within Microsoft’s Xbox ecosystem, but many will be familiar to Windows Phone and Xbox 360 gamers. One such game we’re excited about is Rocket Riot 3D, developed in-house by series creator Codeglue and published by Microsoft Studios. Head past the break for our full preview with lots of exclusive details. For those who’ve never played Rocket Riot, the game can be summed up as a cartoony 2.5D arena-based shooter. The cute bean-shaped characters fly around with rocket propulsion and blast at each other with a variety of armaments. While the game takes place from a 2D perspective, the environments are rendered in 3D and explode into tiny cubes when shot. It makes for a frenzied but lighthearted experience. Check out our Rocket Riot WP7 review (one of my very first for thi site) for more details. Rocket Riot is a twin-stick shooter. The character can fly in any direction using the left stick, while the flicking the right stick (rather than holding it) fires your gun. The Windows Phone version actually controls really well with its virtual sticks, which I consider the finest on the platform. In moving to Windows 8, Rocket Riot 3D supports more control formats than ever before. Virtual sticks return for tablet gamers, while the desktop crowd can go the mouse and-keyboard route. Or plug in an Xbox 360 controller to experience the same controls as the original. Basically, it should play great whether you’re on the go or plugged in with peripherals. 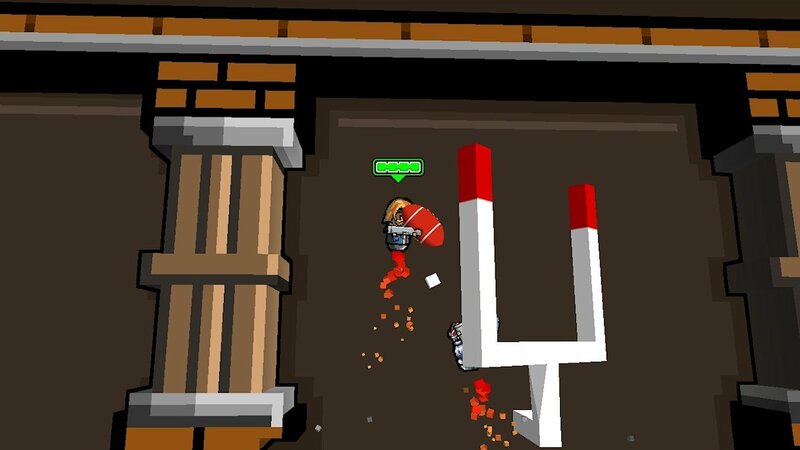 Rocket Riot 3D gets its name from its new stereoscopic 3D support. The extra-dimensional effect works with both red/blue and red/green 3D glasses. Even if you don’t care about adding a third dimension to the visuals, this version still looks better than the original Xbox 360 game. It supports up to 1080P resolution (same as my gaming notebook’s screen, ooh). The environmental explosions (which already looked terrific on WP7 and especially Xbox 360) have also been improved, making the game even more of a riot on the eyes. The Windows Phone version of Rocket Riot’s campaign featured 48 single-player levels – quite a few less than the original XBLA game’s 80 stages, but still decent for a phone game. The story pitted players against the evil pirate Blockbeard, who was quite the devil of an endboss. Thankfully, Rocket Riot 3D not only packs all 80 levels (complete with music cut from the mobile game), it also adds a lot more on top of that – 48 brand new levels. The new campaign’s narrative picks up right where the first one left off. Code Glue doesn’t want to spoil too much of the story, but it will revolve around lumberjacks and samurai (two of history’s most notorious occupations) instead of pirates this time. The levels stringing this epilogue together feature all-new locations and enemies. The new campaign can be selected right from the start, so players who’ve already experienced Rocket Riot on other platforms can jump right into fresh content. Two more additions to the single-player game are minibosses and diseases. 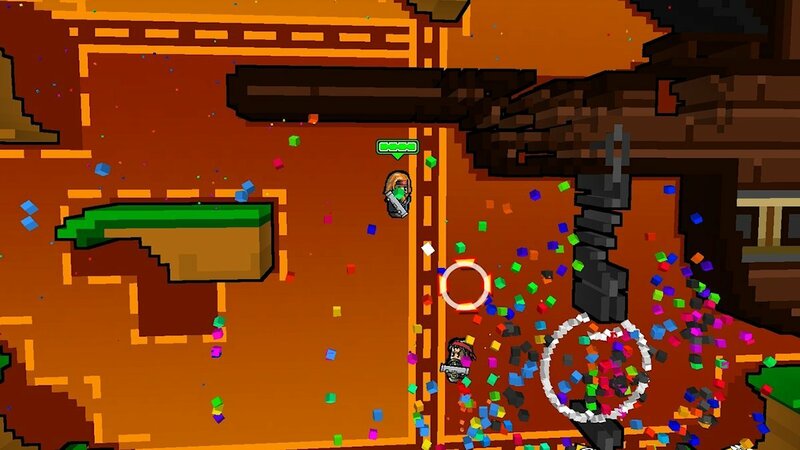 Minibosses will make normal levels more challenging due to their giant size, extra health, and unique offensive powers. Meanwhile, some regular enemies will carry diseases that they can pass on to players. You’ll want to avoid their red rockets like the plague! Rocket Riot 3D doesn’t include real-time multiplayer like the XBLA game as it’s primarily designed around the tablet experience. But the asynchronous Challenge mode that was recently added to the Windows Phone game returns, so you’ll still be able to compete with friends by setting up challenges for each other. A new sharable screenshot feature lets players show off their single-player accomplishments as well. Considering the relative ease of portability between Windows 8 and Windows Phone 8 code, it’s fair to wonder whether Rocket Riot 3D might see a WP8 release. Code Glue doesn’t have any such plans yet, but that could change after WP8 becomes available. 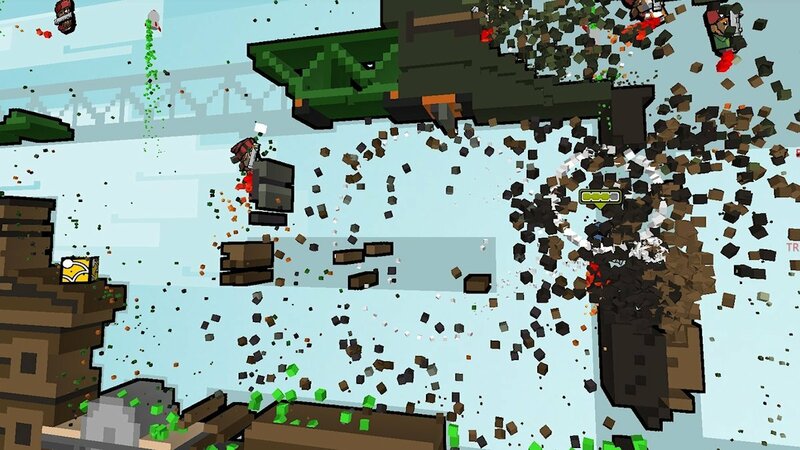 Rocket Riot 3D is scheduled to launch alongside the Windows 8 OS on October 26. It will be an Xbox title and have 200 GamerScore worth of Achievements. We’ll have more to share (including first word of an all-new, ridiculously cool playable character) soon. In addition to checking back with Windows Phone Central, Codeglue asks you to keep an eye on their Facebook page and Twitter account @Codeglue for additional fun tidbits.